The familiar AT&T tagline could just as well be that of the Friendship Force of Dallas. In 1996, during an exchange from Viña del Mar, Chile, ambassador Maruja Corona mentioned her visually impaired grandson, Pablo, and limited resources available in his school for the visually impaired. Ray Enstam, (left) Dallas member and Maruja’s host, immediately thought of fellow member Dr. Bob Langford (right), who is blind. 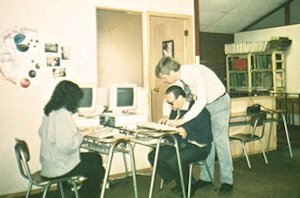 The Dallas club with Langford and Enstam as co-chairs, began exploring the idea of adapting computers for this school as a BridgeBuilder project. 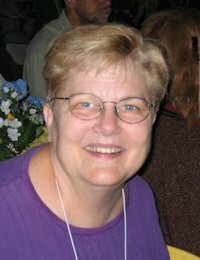 Their research and guidelines have led to the use of voice-synthesized computers for blind children in the United States. Thus, concern for one visually impaired child has touched many others! The Friendship Force of Dallas’ former BridgeBuilder co-chair, Ed Edgren, had previously initiated a connection with the School for the Visually Deficient in Bucharest, Romania. During his latest trip in 2005, he and 22 other FF members delivered 6 computers and monitors to the 200 students enrolled in the Romanian school, bringing the total gift to 18 computers for 2 schools in Bucharest and Buzau. No translation was required to understand the joy this touching gesture meant. Edgren also went to the Texas School for the Blind, where he was given a copy of a 300-page training manual for the Bucharest school to update their curriculum. 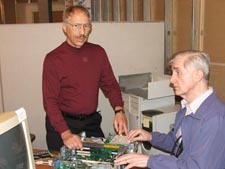 Early on, the Dallas Club realized the easy part is adapting donated computers for schools. Getting them there is the big challenge! Shipping costs are prohibitively high, with the risk a shipment might not even get to the intended recipient. So club members began “tucking” them in as part of their luggage when traveling on an outbound exchange. 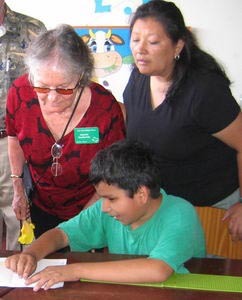 In 2005, Dallas visited La Libertad, Trujillo, Peru and the nearby Tulia Herrera Leon School For the Blind to present their computer gifts. Ray Enstam, exchange director (ED) for this exchange, had carried the first BridgeBuilder computer to Chile almost 10 years ago and thus knows the impact the computers can have on the schools. Personal delivery to the school has truly been one of the highlights of the exchange. The children are excited to host friends from America and to receive the priceless computer gifts that will open their world to information they could not have imagined. There’s not a dry eye in the classroom as bonds of emotional friendship communicate what words in any language cannot. Dallas FF president Paula Rose, herself a teacher of visually impaired students, recognizes other needs these students have. Braille embossed on regular paper is soon flattened and made ineffective by repeated readings. She secured a donation of paper designed for this use from Justin Fegel with Freedom Scientific, a company specializing in technology for the blind. Carol Fencl, ED for the Cincinnati Club, and Oklahoma City ED, MariLyn Beaney, were enlisted to help, by delivering 10 boxes of the special paper directly to the school in Trujillo as part of already-scheduled exchanges to Friendship Force clubs in Trujillo, Peru. They also experienced the intangible gift of human connection with the children. “The teachers in Trujillo are doing an outstanding job with the most outdated equipment I’ve encountered. A Braille embosser costing $2500 is needed and would impact secondary and college students very positively,” Paula emphasizes. Eleanor Roosevelt reminded us, “It is better to light one little candle than to curse the darkness”. Bringing the world to blind children through adapted computers is a touching way to strike back at the darkness. For more information, contact Bob Langford or Ed Edgren.